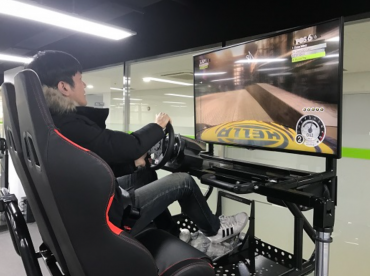 SEOUL, Feb. 12 (Korea Bizwire) — From 5G networks and virtual reality to live 4K broadcasts, cutting-edge technology has become a mainstay of the PyeongChang Winter Olympics. The opening ceremony of the PyeongChang Games last Friday was a monumental showcase of 5G mobile technology, starting from a carefully orchestrated eye-opening drone show to a giant bright dove display of glowing LED candles. Behind the successful execution of the opening ceremony at the PyeongChang Olympic Stadium last week was IT giant Intel and South Korean telecom provider KT, which made it possible to deliver a colorful spectacle and moving performance with a budget of only 60 billion won, a tenth of the budget for the opening ceremony of the 2008 Beijing Olympics, which cost around 600 billion won ($550 million). 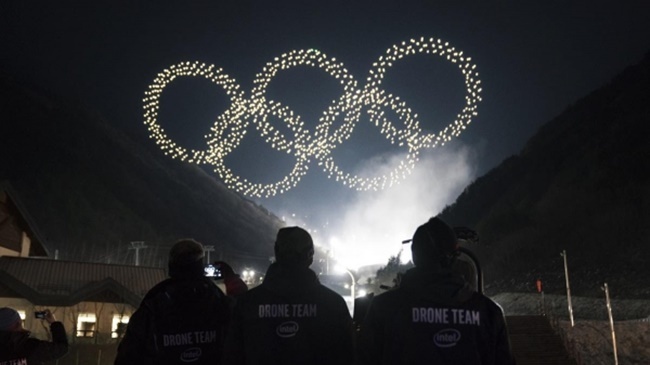 The shape-changing display of 1,218 synchronized drones depicting images of a snowboarder, a dove and the iconic Olympic rings stole the stage, setting a world record and garnering praise from the international media. Viewers around the world were in for a treat as they watched Intel’s swarms of Shooting Star drones break the Guinness World Record for the most drones flown simultaneously. The show was, however, a pre-recorded version of the performance that was filmed last December and broadcast as part of the opening ceremony. 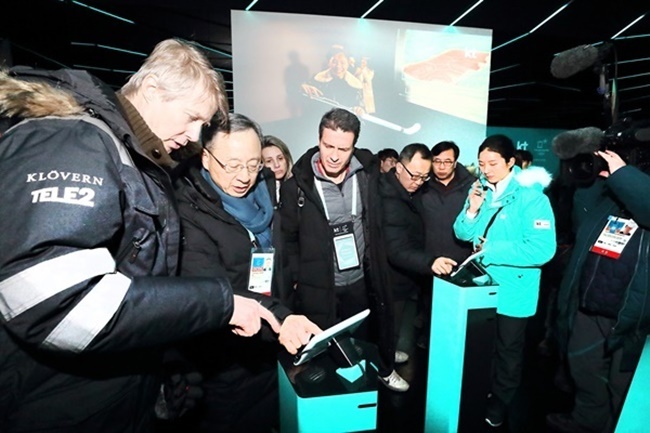 Intel and KT teamed up as part of the KT PyeongChang 5G Special Interest Group last year to trial 5G network technology at this year’s Winter Olympics, with KT providing the network for Intel’s 5G platform. 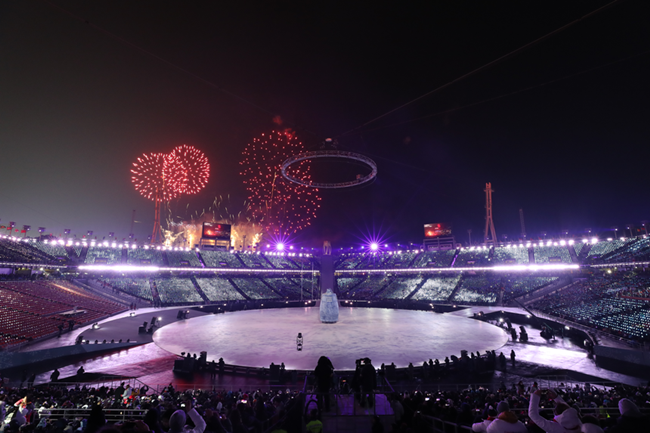 Among the highlights from the opening ceremony was an LED display in the shape of a giant dove of peace, a fitting addition to this year’s Winter Olympics in South Korea, where geopolitical tensions have been heightened over the last few months. A message of peace was sent across the world, as over 1,200 people held LED candles, alongside a rendition of John Lennon’s anti-war song “Imagine” sung by well-known South Korean singers. 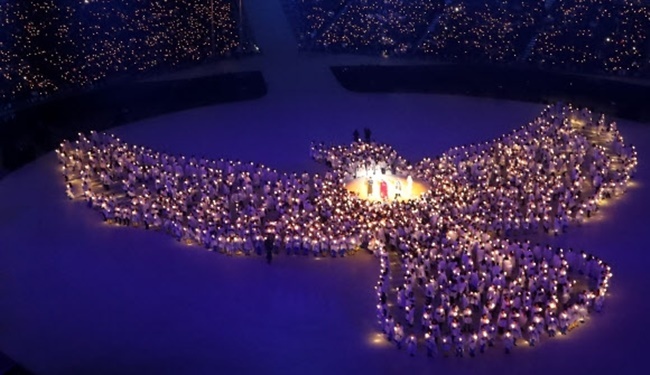 Shot from above, two doves merged into a giant one, with candles held by local volunteers, as children let go of balloons in the shape of doves, in one of the most literal interpretations of the symbol of peace. The performance was carefully orchestrated by KT, as the brightness of the LED lights and flickering were controlled with precision through KTs 5G network in real time. 5G mobile technology allows data to transfer up to 50 times faster than LTE with a much larger processing capacity, and can be used to better control displays of drones and LED lights. Doves also took center stage in the opening ceremony of the Seoul Olympics 30 years ago, during which the birds representing peace were unfortunately burned alive as the Olympic flame was lit, prompting Olympic organizers to replace the tradition with a symbolic display to avoid similar accidents. Intel vice president Julie Coppernoll, says South Korea has done an “amazing job” in the ICT field. Impressed by 5G technology being trialed by KT at the Olympics, Kazuhiro Yoshizawa, president of Japanese mobile telecom network NTT Docomo, also hinted at using the latest network technology at the Tokyo Olympics in 2020 while visiting Pyeongchang. 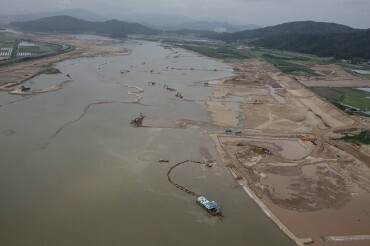 KT is set to commercialize 5G technology for the first time in the world next year. Awesome, The performance was carefully orchestrated by KT, as the brightness of the LED lights and flickering were controlled with precision through KTs 5G network in real time.